When one thing ends another begins. That’s a fairly common saying that gets used for a variety of purposes, from comforting someone going through a breakup to dealing with actual life and death. Here the meaning is a little different as it’s referring to the divide between stylistic eras, giving us one more (never say “last”) look at something which by all rights we should be done with by now, as we’re two full years into rock’s lifespan. But it never hurts to have a refresher course I suppose and this one is particularly suited for just such a thing to show how just a few small decisions can tilt the perception in one direction or another. This record is one that under other circumstances might not have made the grade to be included here as a full-fledged rocker, though to be fair there’s no other style it’s a comfortable fit in either. But like getting into any popular club it’s not always about just being able to pony up the cover charge, but rather it’s often about who you know and in this case Earl Jackson has some influential friends in the form of Johnny Otis and his band of musical miscreants which helps to get him in the door. But to think it’s ONLY Otis’s presence here that allows it to qualify for the rock playlist would be a mistake. Earl Jackson himself is no stranger to the idiom, as those who parsed the details of a record from March 1949 credited to Don Johnson and His Orchestra will remember. The song was called Jackson’s Blues. Earl Jackson had risen to musical prominence playing with Jay McShann, a huge star in the early 1940’s. But it’s now the late 1940’s and Earl Jackson was an alto saxophonist caught up in a tenor sax revolution in a style of music that was far removed from where he’d originated. But in music, especially in the 1940’s black music community, everybody came in contact with everybody else one way or another and connections are made in the most unlikeliest of ways. 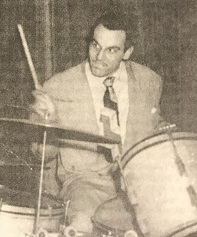 For Jackson, who had played at one time with Harlen Leonard’s Rockets, it came through the ubiquitous Johnny Otis who himself had served time with Leonard’s group as well. Not surprisingly when Otis started The Barrelhouse Club in Watts he had Jackson’s current group play some gigs there. They were able to adapt themselves to the type of music required and were a hit there and, as often happens in these cases, one thing leads to another and record labels became involved. First Jackson cut some songs alongside Otis’s trumpet player, the aforementioned Don Johnson, for Specialty Records. Now he was getting another chance to cut songs under his own name for Supreme, backed by the bulk of Johnny Otis’s band including Johnny himself on drums. Two sides were cut at the end of April 1949 and by the sound of it they were hedging their bets, or rather trying to cover more than one type of music at a time. 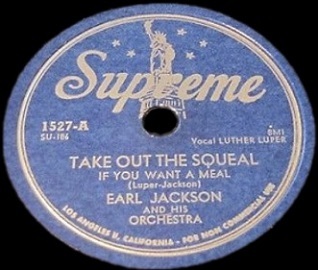 The first song Take Out The Squeal (If You Want A Meal) released back in June might not have been quite as insipid as the title suggests but was definitely looking backwards stylistically, with everything from the arrangement to the lyrics coming from an approach that was five years out of date. Not so with Woman Don’t Want A Good Man No More which for the most part tones down the nods to yesterday and tries to focus on connecting with the hottest current music. They don’t altogether succeed but what works on this is at least worth the effort to give it a fair shake. Ironically the weakest aspect of this might just be Johnny Otis… well, not Otis himself on drums, which are among the better attributes of the record, but the band arrangement itself with its excessive brass section. I know, I know, what else is new? Or rather, what else is OLD? Trumpet-led horn sections are most definitely old and out of step with rock ‘n’ roll and yet time and time again artists who came of age in an era when the trumpet was a vital cog to bands everywhere seem oblivious to the fact times had changed and mercifully had left that sound behind. So the intro to this in all of its strident clamor is somewhat off-putting, the trumpet squawking up a storm, playing with an admirable fervor but with an unfortunate tone it can’t help. Imagine that same passage played with a tenor sax and they might have to scrape you off the ceiling but instead you cringe thinking of the possibility that this entire affair might sink under the weight of a single instrument. It doesn’t thankfully, as the other instruments – including Otis’s stellar drums behind this – give every indication that if they can just wrest the lead away from that one horn they’d be back on the right track in no time. That job initially falls to Walter Roberts who has the task of delivering the vocal here. Unfortunately his singing is probably the second weakest aspect of the record after the aforementioned trumpet. Roberts’ voice is not AWFUL, but just awfully under-powered. A nasally tenor without any resonance or grit in its makeup. His delivery itself is fine, he knows just how to phrase every line and seems to have a solid understanding of the attitude he’s being asked to project here, that of a guy who’s been around the block more than once and is dispensing generic advice to those who probably are complaining about the state of affairs between the sexes. You can’t really tell at first whether Roberts is frustrated about these generational changes in relations as he starts off from the perspective of somebody who almost seems to be telling others to buck up and get back in the ring, but as he goes along, particularly after the break, he starts to reveal that he’s suffering from being unable to handle the shift in power that’s taking place in relationships in this “modern age”. The lines are good, as you can envision the incredulous look on his face as he complains about wives and girlfriends taking men’s paychecks as soon they get them and the ladies promptly leaving them behind as they head off on the town for themselves. He seems powerless to stop this and is reduced to bitching about it to others in the same boat and so maybe his voice, whiny in its natural state, is indeed the right one for the job. We get used to it more or less the longer it goes along in any event, but even so it’s not what grabs our primary attention once the band launches itself into the middle of things. If this is indeed Earl Jackson taking the solo then he either switched to tenor or is the only sax player this side of Earl Bostic who has the ability to make the higher alto sound as if it’s been taking steroids. It’s a full bodied sound, melodic yet rough at times, getting increasingly urgent as it goes along. Aside from that blasted trumpet early on there’s no other horn soloing and since Jackson is the writer and credited artist you assume that this is him doing the honors. But then again on Jackson’s Blues which was written by trumpet player Don Johnson and came out under Johnson’s name, it was Earl Jackson who handled the primary horn so who the hell knows. Whoever and whatever it is being played, it sounds good, giving Woman Don’t Want A Good Man No More a measure of authenticity that it seemed doubtful to earn from the image presented in those first twenty seconds. 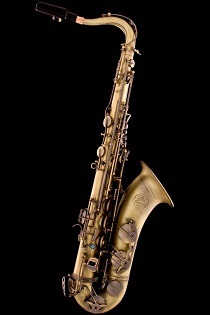 But the sax isn’t the only instrument making their case to be taken seriously here, as the guitarist has plenty to say about the matter as well, never moving to the forefront but consistently making its presence known in the margins as the song hums along. It lends a sinister quality to the entire proceedings, a sideline agitator in the battle between down and out men and upwardly mobile women. The other horns have settled into a more appropriate role now, riffing in the background, switching lines, changing tones, even the trumpet adds a notable distant moan towards the end, as if it too is throwing in the towel in this never ending debate. But regardless of the specific tactics chosen during the bulk of the song they’re always keeping it moving forward. The band themselves may be a curious mix of musicians from different backgrounds, different eras and entirely different mindsets, but once they get it together they work effectively towards a common goal here. As well as they shore up their deficiencies as they go and things start to gel, the fact of the matter is this is still a song that will elicit a much different reaction based on how and when you hear it. 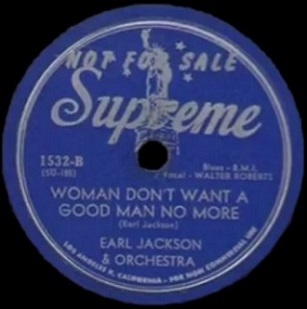 Thrown into the mix of the more modern sounding pure rock records of mid-1949 Woman Don’t Want A Good Man No More comes across as a reasonably shrewd interloper. It’s acceptable but not a seamless fit. You’ll wind up noticing the ill-chosen trumpet more than you’d like and Roberts’ vocals will sound a little more grating in that context. Even the lyrics that can’t seem to decide on a consistent point of view get on your nerves slightly, almost as if you’re using it as evidence that they weren’t quite as cut-out for the rock stage as they want you to believe. But if you listen to the song repeatedly in isolation the weaker aspects become more easily overlooked, or at least tolerated because then the stronger attributes are steadily working their way into your consciousness. The rhythm track hits you harder and draws your admiration for never letting up. The sax solo feels completely authentic when compared to other top flight honkers even if Jackson never fully detonates the horn with his playing, there’s plenty of evidence the fuse is lit and it’s only a matter of time before it explodes. The overall theme is entirely appropriate for rock as well, which might be the most pertinent fact in making its case. The enthusiasm is evident in all of their roles and the commitment is there to assure you that this was no halfhearted compromise, a shallow grab for a buck in a field the main participants otherwise wished to steer clear of. So which of those win out? Are you a generous tipper or a skinflint? A glass half full or half empty kind of a grader? An optimist or a cynic? The goal here on Spontaneous Lunacy is to be neither of course. To not simply be an apologist for anything with traces of rock ‘n’ roll in its DNA, but also not to be an elitist who looks down with scorn at those making honest efforts to fit in when they’re probably not the most ideal candidate for the job. To that end the answer to this question is probably obvious. Woman Don’t Want A Good Man No More is neither the best impression of rock ‘n’ roll at this date, nor is it a charlatan who slipped in the back door. The strongest aspects here are never transcendent, just moderately above average. What falls short is never awful, just slightly below average for the times. Smack dab in the middle of that is a score that’s nothing to be ashamed of. Leave a reply on "Earl Jackson: “Woman Don’t Want A Good Man No More”"